The introduction of more Spanish austerity, in defiance of the protests, was interpreted by many as a sign that a request for financial help is imminent. Therefore, concerns about future inflation made the headlines and sparked gold buying as a hedge against currency devaluation. Consequently, the gold spread trading market rose by $23 to $1,777, recouping the losses seen over the last few days. An explosion that caused the shutdown of a major Canadian refinery triggered a sharp rally in the price of unleaded gasoline. This helped push US crude oil prices $1.77 higher to a close of $91.85. However, the advance in crude was also driven by a sigh of relief in global markets as Spain came up with €40 billion of spending cuts for its next budget. This encouraged participants out of the safety of the US dollar. Yesterday, a stronger US dollar saw a sharp sell off in gold prices, with the market hitting $1,736 at one point. However, bargain hunters helped the precious metal pare some of the early losses to end the session just $7.10 down at $1,753. Having said that, it should be noted that the price of gold has been much more resilient when compared with the recent falls in crude oil prices, stock markets and the euro. Despite the weekly crude oil inventories report showing a fall of 2.4 million barrels, versus estimates for a 1.7 million rise, US crude oil lost $0.84 to $89.98 yesterday. This was driven by a rush into the dollar, as well as indications of continuing weak demand for oil. Crude oil analysis shows that the trend has become undoubtedly bearish, with the current market prices below all three short-term moving averages. After a short lived rally in the early part of the session, gold reversed course and headed lower, losing $3.15 for the day to $1,760.40. A stronger US dollar, which is inversely correlated with the metal, weighed on the market, but the losses may also suggest some uneasiness now that QE3 has been priced in. The spread trading charts are definitely suggesting that the rally is losing steam. Yesterday's rebound in US consumer confidence kept energy investors rather optimistic initially, with oil prices moving higher. However, a slump in the stock market and a rise in the dollar quickly soured the mood, with WTI crude slipping into the red and closing the day $0.74 lower at $91.37 a barrel. In commodities trading, the Spanish delay in asking for a bailout, which had been recently priced in, sent gold investors to the exit yesterday. A rebound in the dollar also put downside pressure on the price of the precious metal, causing it to lose $8.70 and close at $1,764.20. Will it be a battle with the US dollar for the safe haven spot, or all the talk about devaluation of paper currency that gives gold prices the next boost? Economic data from China, the world's second biggest oil consumer, indicated that manufacturing had failed to rebound in the country, with authorities deciding not to increase domestic investment. On top of that, even Germany, the main economic hope for Europe, is struggling. Faced with this gloomy outlook, energy investors took a step back yesterday, raising questions about future oil demand. This weighed on the US crude oil futures trading market, with the price falling $1.25 to $91.93. Renewed fears over paper currency devaluation, as Spain seems to be preparing for a rescue program, has pushed gold prices to fresh recent highs. The precious metal reached an intraday high of $1,787 on Friday, last seen on 29 February, but retraced on position squaring ahead of the weekend. The gold market ultimately closed $4.90 higher at $1,772. We saw another quiet session for crude oil after the market had tumbled sharply in the first half of last week. US crude oil finished almost flat at $92.89 a barrel. Rumours of an imminent draft to save Spain did enough to interrupt a decline in oil prices, with a lack of clear direction in shares also keeping investors on the sidelines. 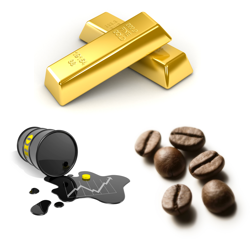 In commodities trading, the gold market remains solidly at the recent highs, with any selling being quickly reversed. We are currently trading at $1,774, and the support at $1,750/55 is holding up against breaks to the down side. To the upside, the $1,780/85 resistance level is keeping us at bay for the time being. The November Brent crude oil futures market has dropped over $10 in a few sessions, but is now starting to see some support below $108 as clients buy into the recent weakness. For all of the news about the weak global economy and social unrest, the price of crude oil has seen a trading range around $110 for nearly 21 months now. Although bear in mind that this range does have a low of $90 and a high of nearly $130. As we are now at $110.28, it's almost 'toss a coin' time. However, it is fair to say that past price falls have tended to be larger than just $10, with $15 being more usual. Gold is a major winner with all the central bank easing. The relative scarcity of the actual metal and the distressing inability of politicians/banks to create more out of thin air have helped boost the futures market. Dealers continue to buy into any dips and, so far, their faith has been repaid over the last eight or nine years, with only the peak of last August dampening optimism. Over the last few days, the $1,750's have proved to be a good support on the down side, with $1,738/42 also being a tough barrier. To the upside, resistance is at $1,778/82 and then the peak of last February at $1,788/90. Importantly, investors should note that the next Fed/ECB/BoE/BoJ loosening could be a trigger to further gains. Nevertheless, this morning's early weakness is looking to have petered out and our clients are already buying into the move. Investors continue to worry about returning inflation somewhere down the line and so bargain hunters have pushed gold prices back up after the previous day's decline. Although the initial rally has lost some steam, the unlimited buying pledge from the Federal Reserve is a strong supporter of the precious metal. Yesterday, it recouped almost $10 to $1,771. FedEx, one of the bellwethers of US economy, cut its profit forecast for this year, thus denting an optimism which had dominated the markets for the last few weeks. The fresh doubts spilled over into the energy markets and saw US crude continue to slump, with the market losing $1.42 to $95.29 a barrel. This afternoon's weekly inventories report will be closely watched for any hints about the next possible direction for crude oil. Gold investors started the week in no mood to add to their long positions, favouring taking some cash off the table. This pushed the precious metal $8.10 lower to $1,762.00. QE3 now seems to have been largely priced in, so the gold market could go back to looking for direction from the US dollar and the shares markets. In the energy markets, it is not yet clear whether it was a 'fat finger' mistake, but the price of US crude oil dropped $3 in around a minute or so yesterday. The market ultimately closed $2.89 lower, at $96.26, despite only slight declines in the major indices and a minimal gain for the US dollar. In commodities trading, the gold market edged higher on Friday, bolstered by a lower dollar and worries of currency devaluation on both sides of the Atlantic. The precious metal reached an intraday high of $1,777 and, despite some late profit taking, still ended $3 up at $1,769.60. Judging by bulls' appetite earlier this morning, it would take courage to sell into the rally. The demand for hard assets triggered by QE3 sent participants into US crude oil, briefly pushing it above the $100.00 mark. Overall, the price of US crude gained $0.96 to close at $99.00; also helped by an escalation of protests in the Middle East and North Africa. In crude oil analysis, the short-term trend turned bullish again last week, with the current price sitting comfortably above the moving averages. Commodity investors are still waiting for the catalyst that will cause gold to break out of the $1,660-1,680 range that it's been trapped in since last week. Yesterday, the precious metal closed $6.7 higher at...» read more. The gold spread trading market slipped by around $10 yesterday. This came on news that global gold demand had dropped by 11% in the three months to September, tumbling from record levels seen in the same period last year. The World Gold Council's report...» read more. Despite being perceived as a hedge against troubled times, gold lost yesterday's battle with the dollar as a safe haven asset. Instead, because the two are inversely correlated, the precious metal joined the rest of the commodities spread trading market, losing...» read more. In online commodities spread trading, the Spanish delay in asking for a bailout, which had been recently priced in, sent gold investors to the exit. A rebound in the dollar also put downside pressure on the price of the precious metal, causing it to lose $8.70 and...» read more. Commodity investors' appetite for risk was revived by the US employment report, which literally saved the week. Some of that renewed interest was attracted by the precious metals, which pushed gold prices...» read more. Even though gold is considered to be a safe haven it hasn't managed to capitalise on the recent turmoil within the markets. The uptrend remains in tact and so the gold bulls are probably sitting on the sidelines waiting to...» read more.